Fort Moore Hill | What's YOUR Ghost Story? Surviving (and ENJOYING) Jury Duty in Downtown LA! I recently had the experience of having to do jury duty and…. had a great time! I am one of those “lucky” people who have actually gotten called for jury duty three times in the last three years. Yes, I have gotten out of it in the past with legitimate reasons I was unable to serve. This time, however, I gave it a go. Okay, I did try to get out of it a few times until it got to the point that trying to get out of jury duty was more of a nuisance than actually serving jury duty. So, to show off the bright spots of jury duty and to provide you with a jury duty survival guide, I wanted to create this post. If you’re on this site, I imagine you are interested in ghost stories, local history, crime history, Los Angeles and visiting museums. If you keep an eye on these themes, then serving jury duty is downright exciting! I know that sounds like BS, but stay with me here. The first part of jury duty and truly the only part that most people experience is being in the “jury pool.” It’s just a big waiting room full of people hanging out. Honestly, is that so bad? Most people keep themselves busy with their iPads, phones, laptops, etc. There is Wi-Fi, so it’s not a bad way to get some work done. I, on the other hand, did a lot of reading. I got deep into a fascinating book on the Prohibition era that deserve its own blog entry. However, if you are serving jury duty in downtown LA, I would strongly suggest reading “A Bright and Guilty Place: Murder, Corruption & LA’s Scandalous Coming of Age.” This amazing book covers the frequently lawless and corrupt age of life in Los Angeles, a town that was growing faster than its infrastructure was ready for. The book covers topics like the Castaic Damn disaster and Clara Bow’s blackmail case. Back to jury duty. Each day you get a 90-minute lunch. That’s crazy! What’s more crazy is that most people stay local or even eat in the building. In 90 minutes, you can walk to a lot of great places, taking a nice tour in the process. After giving quite a few tours and frequently losing tour members to Mr. Churro, I decided that this was finally my time to check the place out. Leaving 210 W. Temple (pictured, top with the white Pico House building visible on the far right) and walking North up Spring Street, you get a lot of great views of the Pueblo de Los Angeles area (pictured directly above). This is our destination and also where the city of Los Angeles was born. On your left, you walk past the largest cement military memorial in all of America, a tribute to the Mormon Battalion and the site of Fort Moore (pictured right). 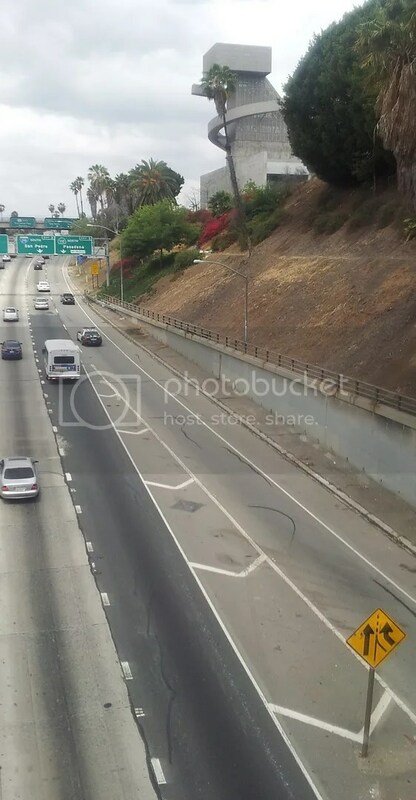 Crossing the next overpass gives you a great perspective on exactly how much of the original Moore Hill (specifically the land that was Moore Hill Cemetery) was dug out to make room for the 101 freeway. Yes, in a tale straight from the movie Poltergeist, a cemetery was moved (said bodies are now located in Rosedale Cemetery in the West Adams neighborhood, by the way). Yes, there was a school (that crazy stainless steel building) that was built on a former cemetery and yes, that is a haunted building. Bodies from the original cemetery were found on this site from the original cemetery as recently as 2009. Continuing down Spring, you’ll eventually make a right at the corner of Spring and Ord. This is the site where, not all that long ago really, LA was gripped by the possibility that huge quantities of buried treasure was hidden underground throughout LA. Who put this treasure here? A now extinct species of 6 foot tall reptiles, of course (this is a true and strange footnote in LA’s already strange enough history). 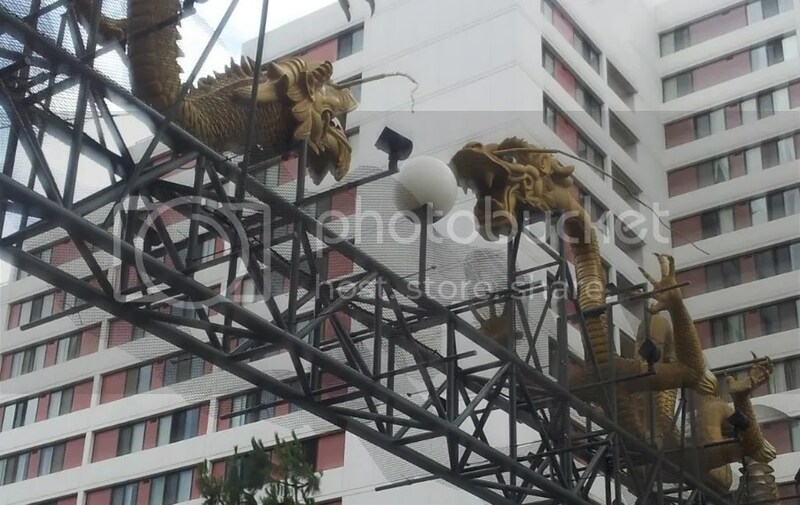 Now turning the corner and heading through Chinatown, you get a nice look at the ornate dragons that keep watch over the neighborhood before walking a couple more blocks to Olivera Street. Getting here has only taken about 15-20 minutes out of the 90 minute lunch, so there’s even time to visit the free Old Plaza Fire House museum (pictured left, with City Hall in the background on the right edge of frame), which is really not much of a museum, but you do get to enter one of the original fire stations in LA and see some of the vintage fire fighting gear and impressive photos of the LAFD in action through the years. To read more about this haunted history of the Pueblo de Los Angeles including Pico House, the Avila Adobe (also a free location to visit) and La Gondoloria Resuaturant, check out my article here. I grabbed my lunch to go (it did live up to the hype) and walked back to and past the courthouse building to have lunch in LA’s Grand Park. It’s no Grant Park in Chicago or Central Park in New York, but the city has done a lot to create a gorgeous, large park right in the middle of this portion of the city. 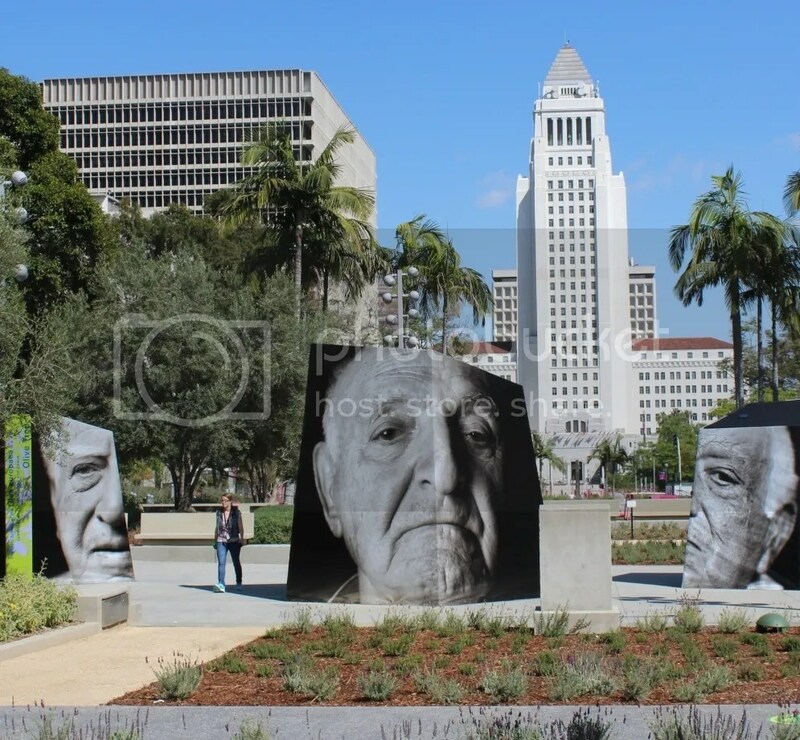 In addition to a nice aesthetic, there are exhibits worth viewing including quotes and pictures from survivors the Armenian Genocide (pictured below, right with City Hall looming in the center of the image and the criminal courts building on the left). Day 1 ended with me actually getting assigned to a case. Though most cases are only 1-2 days, this one was estimated to take 6 days if I was selected to the jury. This was not a lock as I was one of about 50 people to make it to this stage. My second day of jury duty started around 11am or so and after just 60 minutes of jury duty, it was time for my 90 minute lunch. It’s amazing anything gets done, really. Unfortunately, on this day it was raining, so I decided to see what fun I could have in the building. Unfortunately there is no top floor observation deck, but I did find a museum-caliber display covering both the 17th and 18th floor of the building. It’s amazing! The displays are floor-to-ceiling and do cover every lady square inch of the walls on the two floors. The display is a timeline of crime in LA (technically, it’s about the district attorney’s office, since we are on the floor the D.A. is on). 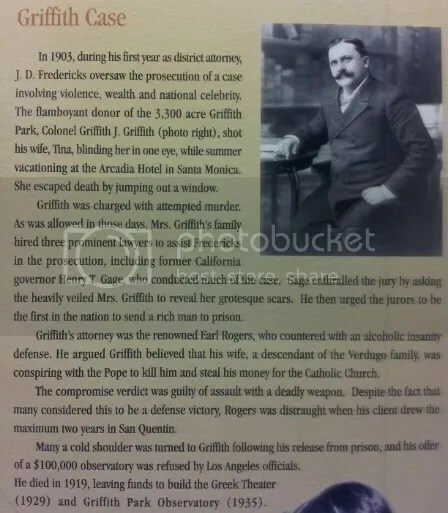 The perspective is interesting, looking at the history of Los Angeles as it relates to crime, from the 1871 Chinese Massacre through the Griffith J. Griffith attempted murder case in 1903, the 1910 LA Times building bombing, Bugsy and Mickey’s Mafia control in the ’30s, the career-ruining Pantages trials the Manson Family trial, through the modern age of the LA Riots and the OJ trial. Among the more well-known stories are some tremendous events that today are largely forgotten. 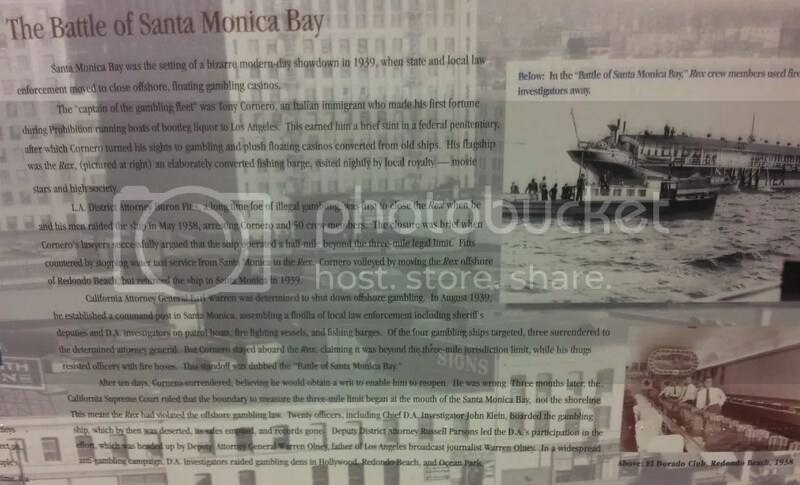 Did you know that there were sea battles just a few miles beyond the Santa Monica Pier between authorities and floating casinos? It’s a saga that went on for years and somehow we haven’t seen a movie based on these events yet(?). Tony Stralla’s name appears on these walls a couple of times. Before he went on to create the Stardust Casino on the Vegas strip, he was a prohibition-era bootlegger and casino operator in the soutland. 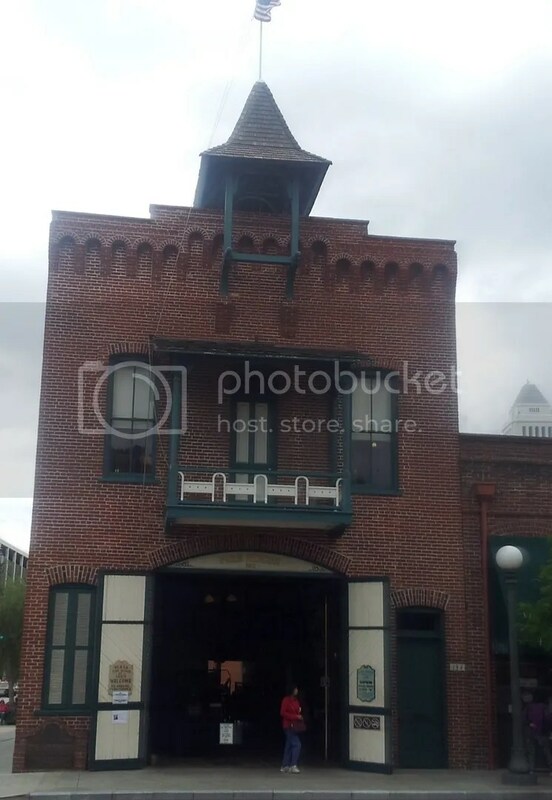 This location also ties in beautifully with the afore-mentioned book, “A Bright and Guilty Place,” as pretty much every event covered in the book also appears on these walls, as well as personalities like Dave Clark (an LA City prosecutor who got his hands dirty and bloody more than once) and Burton Fitts. 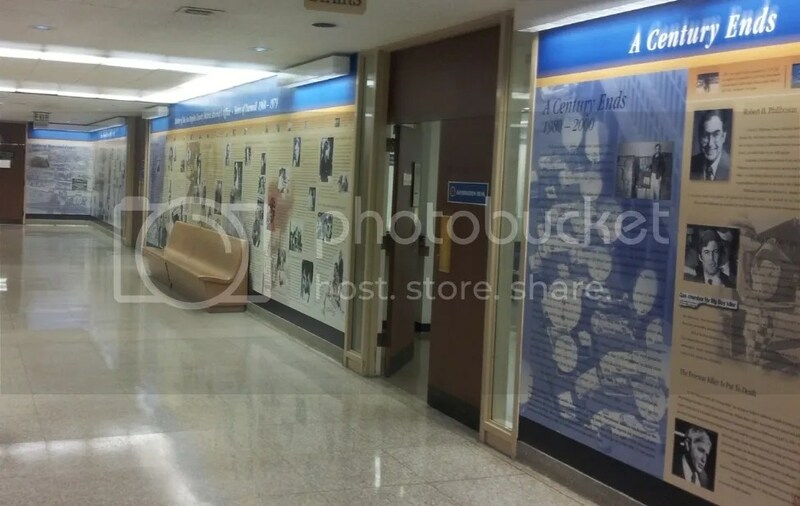 LA’s DA office is about to move to another building, so this exhibit will not be here forever, so whether or not you have jury duty, this is a public building, so make sure you make time soon to go up and walk these halls. 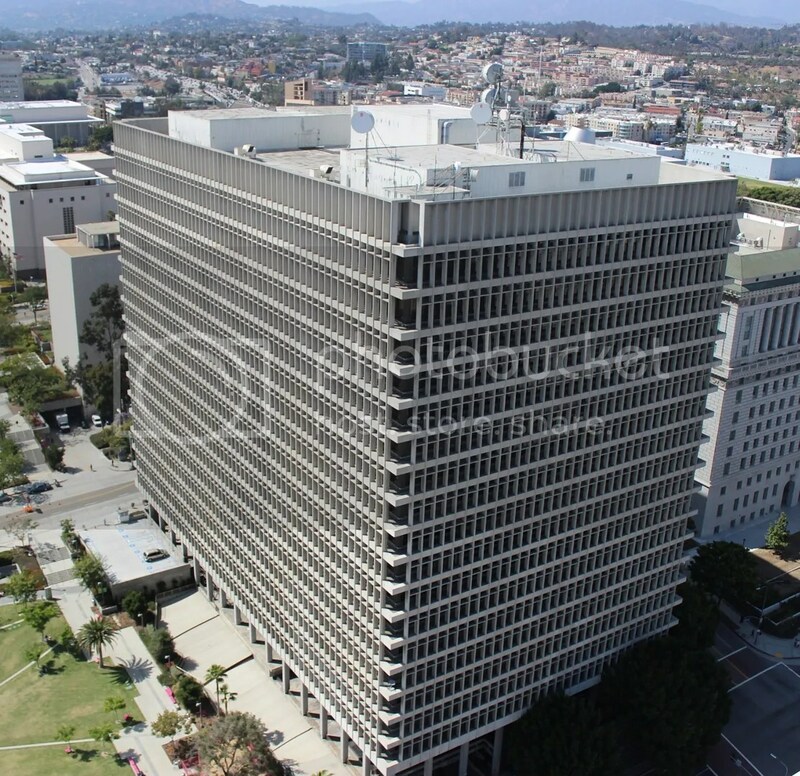 Another must-do in this area is check out the observation deck on the LA City Hall building located just across the street from the Clara Shortridge Foltz Criminal Justice Center, named after the first female lawyer on the west coast. 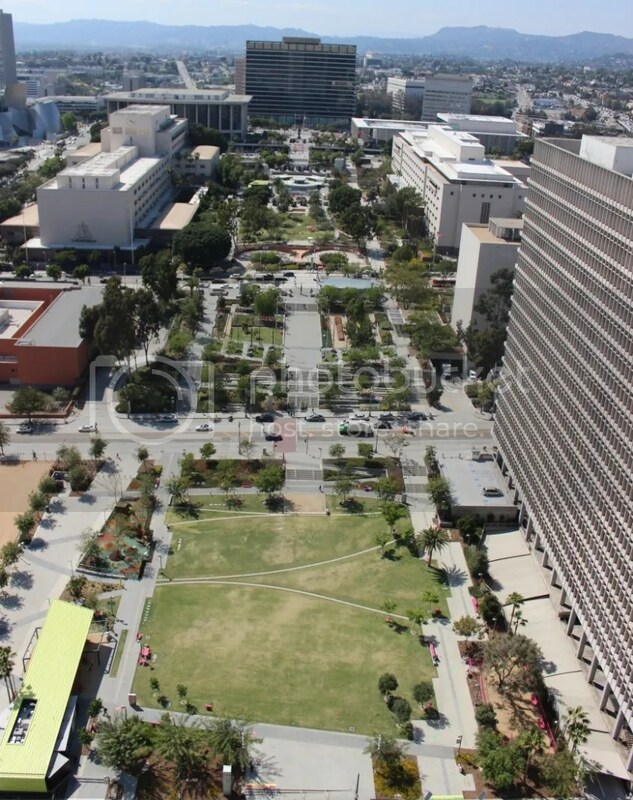 Jury duty or not, this location offers some of the best views of downtown LA and is a must visit. Sadly, the view towards the Hollywood Sign and the Griffith Observatory is frequently obscured by smog and other larger buildings in the area block some other ideal sites, but it’s still well worth the visit. West Hollywood, the Brewery artists lofts and, much closer Broadway and the Walt Disney Concert Hall. This is specifically a way to handle jury duty here in downtown LA, but when it comes down to it, no matter where you are, you can find an interesting way to entertain yourself. Turn it into an opportunity. How often do you have 90 minutes to kill away from home? We’re always in a rush nowadays and you can use this time to your personal benefit. The fact that you’re also pridefully doing your duty as a US citizen…. also a nice perk. Scott and I decided to check out a couple of the historic and noteworthy cemeteries near us. Earlier in the week we drove past Rosedale Cemetery in West Adams district as it was closing and couldn’t wait to go back for a closer look. 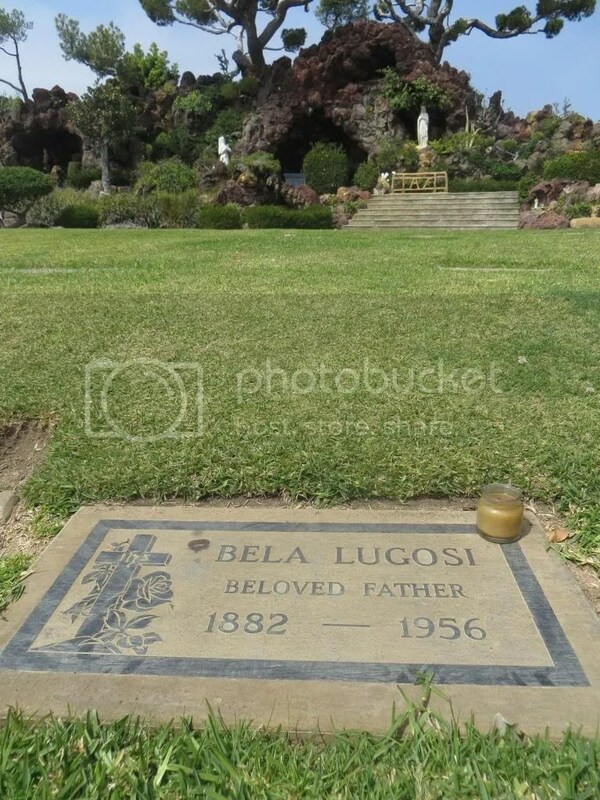 I have also wanted to see Bela Lugosi’s grave at the massive Holy Cross cemetery. So we grabbed our cameras and headed out grave hunting! We started out in Culver City’s Holy Cross Cemetery. Opened in 1939, Holy Cross is a beautiful, 200-acre, clean cut, Roman Catholic cemetery that is the resting place to many memorable people, and is still in operation today, Scott and I saw quite a few processions come and go during our visit. We’ve never been able to use the word “bustling” to describe a cemetery before, but this place was absolutely busy. 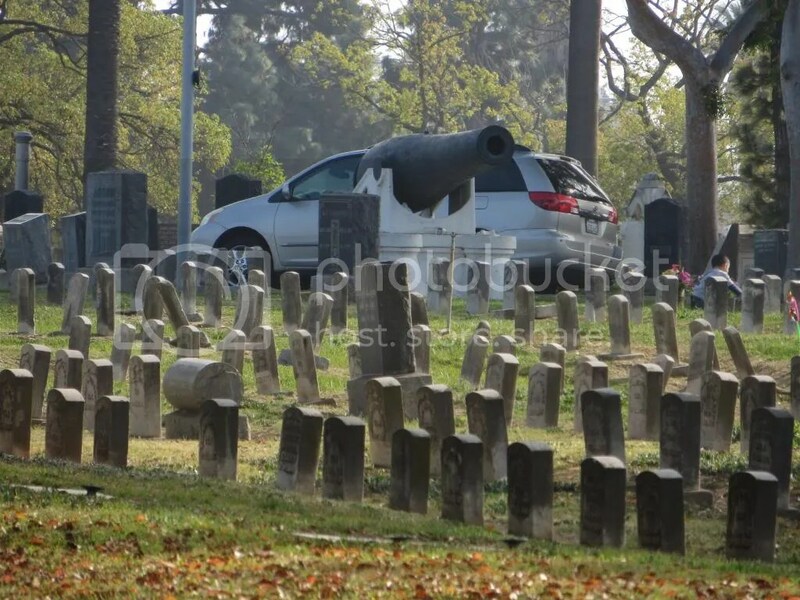 In LA there can even be traffic in a cemetery. Holy Cross has many a famous burial. Bela Lugosi, who played Dracula on stage and in the 1931 movie (and is famously buried in his cape) is here. As is Sharron Tate the actress, wife of Roman Polanski and murder victim. She and five others were murdered by the Manson Family in 1969. Tate’s grave marker also bears the name of her unborn baby as she was pregnant at the time of her murder. Lugosi and Tate are buried in front of the grotto at Holy Cross Cemetery near two other noteworthy or famous graves: one of the most popular singers of all time, Bing Crosby and Oz’s Tinman, Jack Haley. There’s actually three actors from The Wizard of Oz in this cemetery. In addition to Haley, the actor who portrayed the Scarecrow, Ray Bolger, can be found in a wall crypt, as well as Billy Rhodes, one of the Munchkins! The Adams Family’s Uncle Fester, John Leslie Coogan Jr., also finally finds rest at Holy Cross. Prior to his life as an Adam, he was discovered as a child by Charlie Chaplin and was the kid in the movie “The Kid.” In between, Coogan met tragedy over and over again. Some of his tragedies lead to the betterment of all people as Coogan’s Law, the first law protecting child actors, is named after Coogan’s battle with his parents. 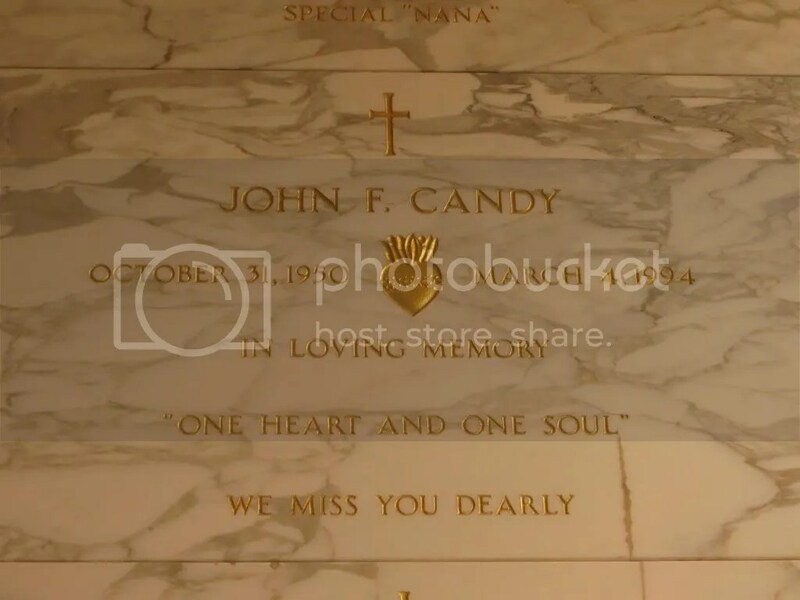 One of the most famous comic actors of our time, John Candy, is found in the communal mausoleum. He died of a heart attack at the age of 43, famous for roles on Second City Television, and on the big screen in Planes, Trains & Automobiles, Spaceballs, Stripes and Uncle Buck, among many others. Candy is interred just above Fred MacMurray, star of Billy Wilder’s “Double Indemnity and the small screen’s My Three Sons. 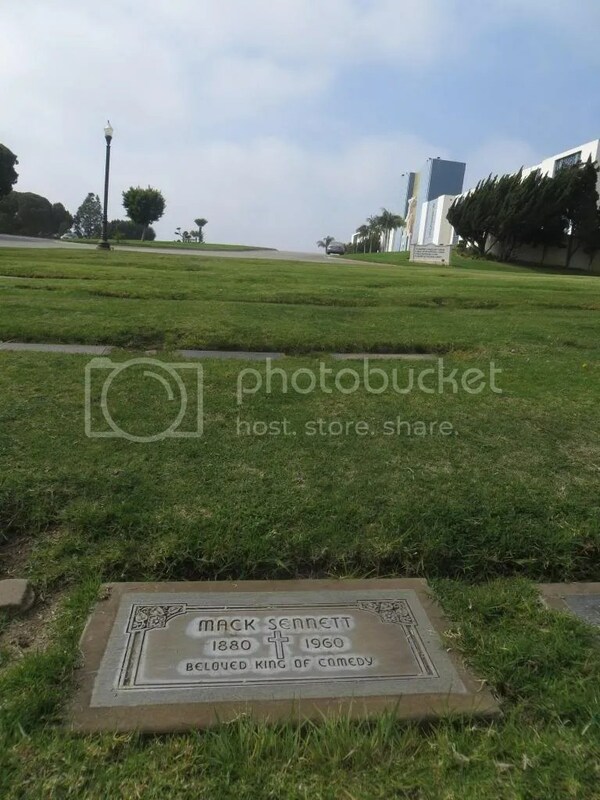 Just outside of the mausoleum one can find Mack Sennett. Sennett was film’s first “King of Comedy.” He started Keystone Studios, built LA’s first soundstage and helped lauch the careers of Charlie Chaplin, Fatty Arbuckle, Gloria Swanson the Keystone Kops and was an early collaborator of D.W. Griffith’s. In all, he is credited as producer on over 1,100 films, directed over 300 and personally appeared in over 350 films. The cemetery is vast though sadly lacking in personality. We imagine it might be against cemetery policy to have unique or upright stones. 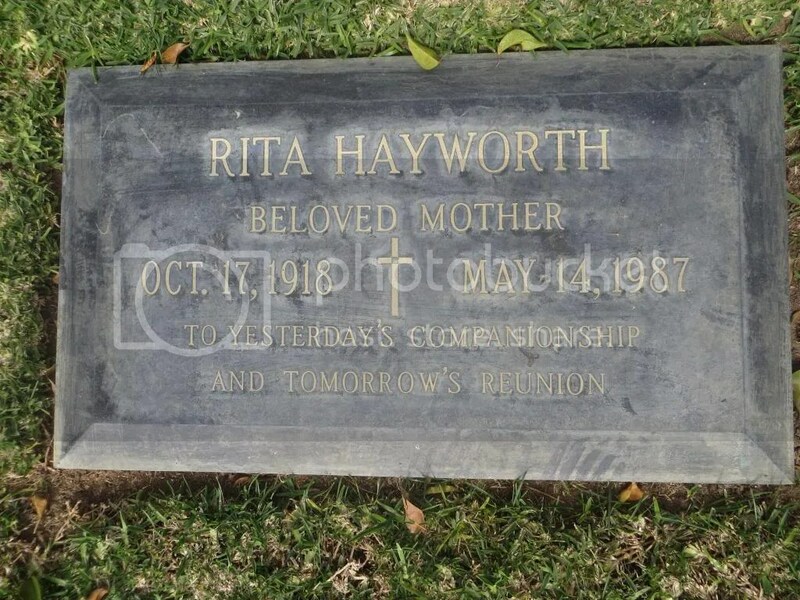 However, upon visiting Rita Hayworth’s grave, we thought we would see more than simply a name with death dates. The same goes for Lugosi, who likely has one of the more visited graves in LA. We would imagine that a person wanting to be buried in Dracula’s cape would want to express himself on his stone as well. The Pierce Brothers cemetery in Westwood Village is a cemetery with a lot more personality. We’ll write about that site in a future post. Next, we visited Angelus-Rosedale Cemetery. Rosedale is one of the first cemeteries in Los Angeles, opening in 1884, and is the final home to pioneers, politicians, and businessmen of LA. Rosedale is also home to the first crematory west of the Rockies (second in the nation). The 64-acre plot is the resting place of more than 100,000 people and was one of the first to be open to all races and faiths. 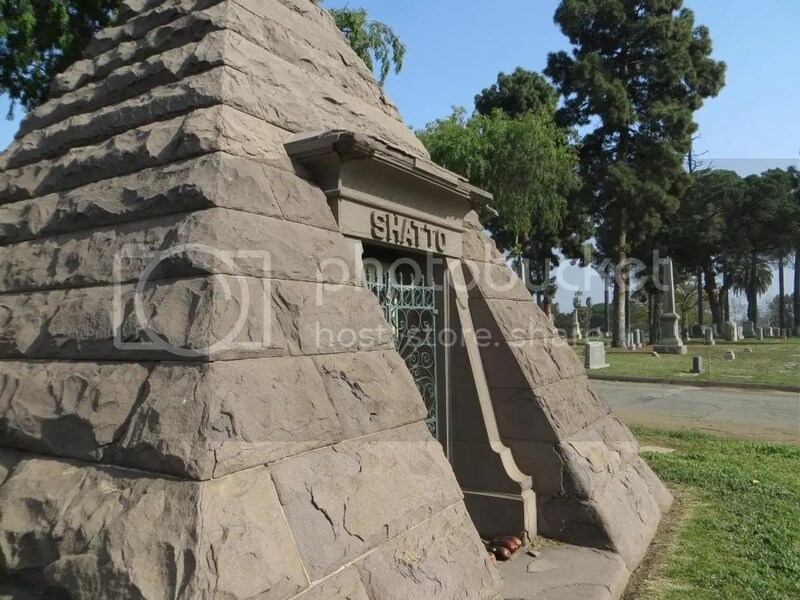 One of the two pyramid tombs at Rosedale belongs to George Shatto one of the first developers of Catalina Island. Shatto, it seems is still being taken care of in the afterlife, we found eggplants left at the opening to his personal mausoleum. Perhaps this is offering of food for him in the afterlife(?). Phineas Banning rests nearby; Phineas was a businessman famous for his effort to create a busy port in Los Angeles. Another developer, David Burbank, is close by. 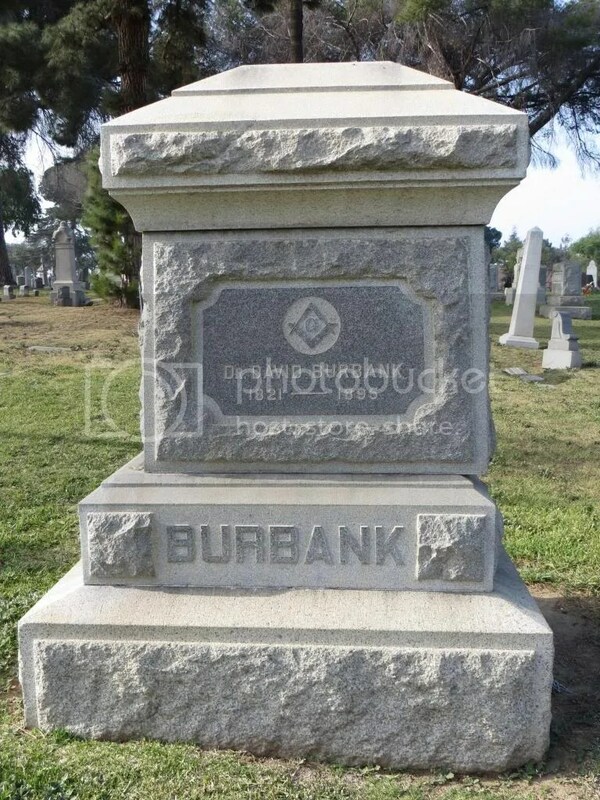 Burbank is the dentist and entrepreneur of whom the city of Burbank is named. Louise Peete, a “black widow” serial killer is buried in a unmarked grave at the cemetery. Though stories and numbers on those she lead to death are exaggerated, she remains one of just four women sent death in San Quentin’s gas chamber. Conversely, murder victim Mable Monohan also rests here. Her death lead to the arrests of Barbra Graham, Emmett Perkins, and Jack Santo. Monohan was murdered by the three who were looking for a safe they believed Mable’s son (a casino owner) kept at the house. The execution of Barbara Graham lead to multiple movies, made for TV movies and plays titled “I Want to Live,” however, these stories are greatly inaccurate. Some of the more surprising interments at Rosedale include Eliza Poor Houghton. She is one of 48 survivors of the famous Donner Party. The group started of with 89 people who became trapped in the Sierra Nevada mountain range in the winter of 1846. Maria Rasputin, the daughter of the “Mad Monk,” Grigori Rasputin, also rests at the cemetery! After her father’s assassination in 1917, Maria moved to Bucharest where she became a cabaret dancer. Then she was off to Paris to be a governess, before moving to America as a Lion Tamer with Ringling Brothers Circus. Maria also worked as a Riveter in Florida during WWII before moving one last time to Los Angeles, where she stayed. 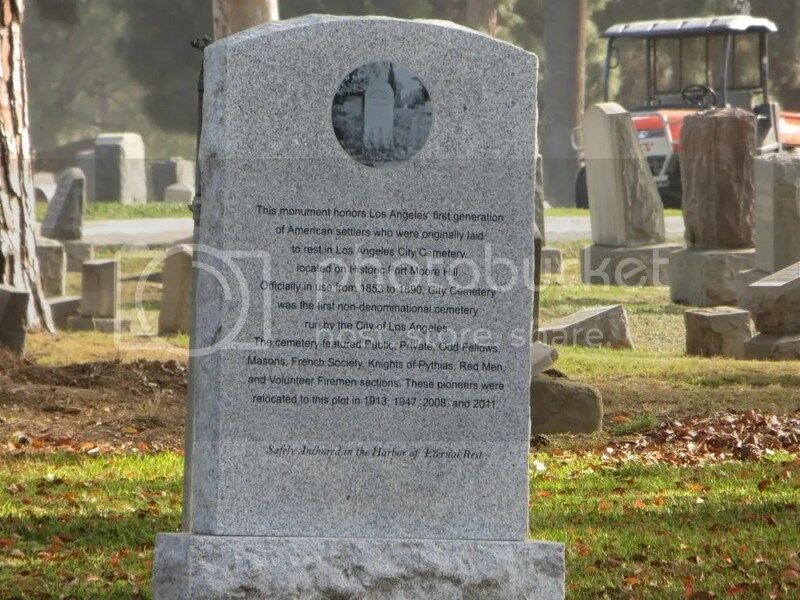 Also buried at Angeles-Rosedale is the magician Henry Keller, who is said to be one of Harry Houdini’s inspirations, as well as Hattie McDaniel, the first African-American to win an Academy Award, for Gone With the Wind in 1939, and Tod Browning, “The Master of the Macabre”, and director of 1931’s Dracula. Rosedale is also one of the Cemeteries holding LA’s original pioneers and military men. 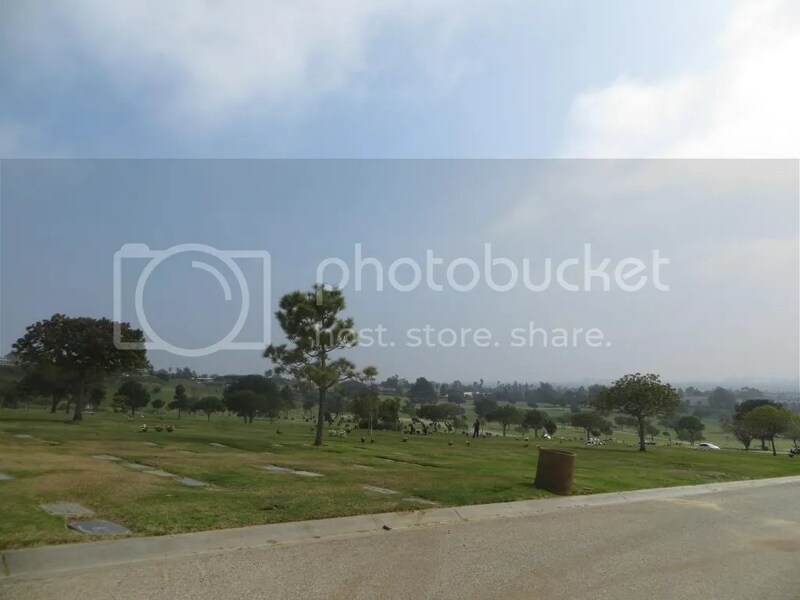 The cemetery at Fort Moore Hill (now downtown LA) was raized with many of the bodies being relocated to Rosedale. However, the relocation was done with little care. Far more headstones than actual bodies made the initial trip. Bodies continue to be found at the former cemetery site and moved to Rosedale with the most recent interment happening as recently as 2011! Join us on our tour to hear more about Fort Moore Hill, visit the site of the former cemetery and hear other legends of the Fort Moore Hill area! Have you heard any ghost stories about these sites? We’d love to hear about them! Please leave a comment below!